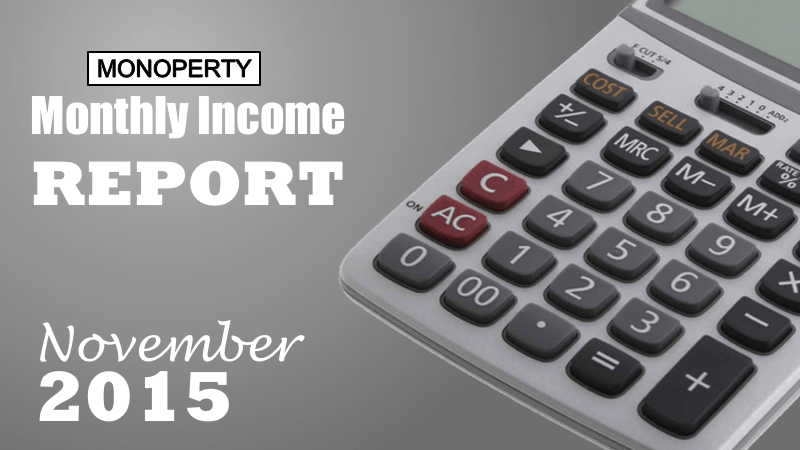 Welcome to my monthly income report for November 2015! I am going to starts this months report with a slightly new (and improved) format to make it easier for you to digest, and for me to write and keep on track. There are essentially 3 key areas that form my reports: Letting Agents, Utility Bills, Income and Expenditure. Lets go! I had some sightly bad news and some VERY good news this month. Firstly, one of my original 4 tenants from Property 2 decided to leave this month. He informed the letting agent that he wasn’t happy because of the lack of some communal features in the property and wanted leave. The first I heard about this, was after the tenant had actually left. I was not happy! The tenant had emailed the letting agent several times expressing his concerns and I was not informed of this. Had I known, I would have done what I could to address the issues. The letting agent suggested that he should surrender his deposit of £100.00 for breaking his contract early, which he agreed to. After expressing my frustrations with the letting agent, they assured me that this would not happen again, and they found another tenant within a week. Now the good news. Within 2 days of having my planning permission approved for change of use to the property, I had a second letting agent contact me to say they had 5 tenants who were ready to move in. I spent the next 3 days assembling decent mid-range flat packed furniture from Ikea, and the tenants were in situ within a week. I hadn’t previously furnished those rooms incase my planning permission wasn’t approved. The tenancy is through a company who accommodate local tradesmen and is on a 3 month rolling contract. This appears to be quite common at the moment with a new hospital being built and several big business moving to, or expanding, in the local area. I have been using First Utility for Property 1 for a couple of years now and I have been happy with the service that they provide. A couple of months ago, I received an email from them informing me that they were sorry to see me leave. I immediately contacted them as this was news to me, and soon discovered that my letting agent had requested the change of supplier as a result of the new tenancy agreement that was signed on 28th August 2015. I was fuming! What right did they have to change the utility provider? They explained that it was standard practice for their office to do this when they arrange a new tenancy, and that details were in the contract which I signed. The fact was, I saw this tenancy agreement as a renewal because 3 out of the 4 tenants stayed from the previous year, so there was only 1 new addition. I requested that the change be reversed as I was not willing to pay another utility provider, and the new provider did not have my payment details anyway. The agent were unable to undo this, and when I contacted the new provider they couldn’t assist me either as my name was not on the account. This became a total cluster to say the least! After taking advice I reported this issue to First Utility who then recorded it as an ‘Erroneous Transfer’, and requested that the supply be handed back to them. It is now a waiting game for me whilst the two energy providers resolve the matter. As a result, my utility payments have not been deducted this month and they will not start again until First Utility have full control over my energy supply. At last, Property 2 is finally self funding and generating an income. It has only taken 6 months! Far too long, but I have learned a lot and will approach things differently next time. I will continue to chase the transfer of my energy supply back to First Utility and I will increase my monthly payments to Sainsbury’s Energy who provide the electric and gas to the second property, as I now have more people living there and using more energy. Please leave a comment below if you have any questions, or if you would like to know more about this income report.